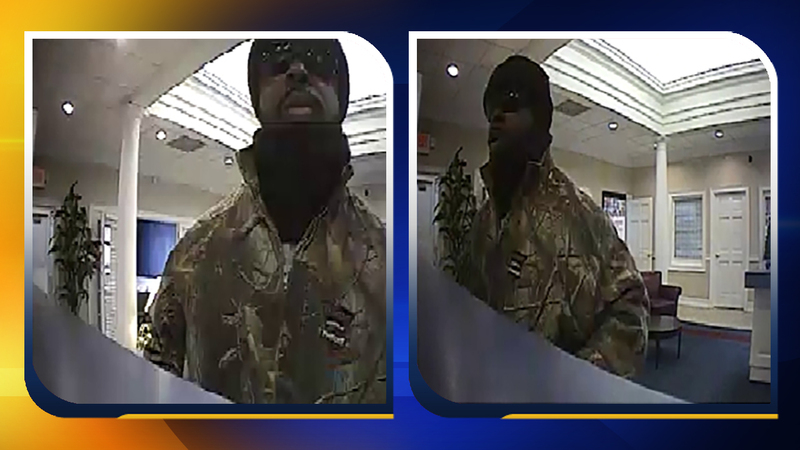 GRAHAM, NC (WTVD) -- Graham Police are searching for a suspect in the armed robbery of a bank on Monday. Police in the Alamance County town said the incident happened shortly before 10 a.m. at the American National Bank at 842 S. Main St.
Police said a man entered the bank and demanded money. He fled with an undisclosed amount of cash. He was last seen traveling south on foot. The suspect was described as having a dark complexion, approximately 5 feet 9 inches tall with facial hair. He was wearing jeans, a camouflage jacket, sunglasses, and a dark toboggan. Anyone with information about this crime is asked to call the Graham Police Department Criminal Investigations Division at (336) 570-6711 or Crime Stoppers at (336) 229-7100. Callers may remain anonymous.